The last four weeks have been as dry as any four weeks that I can remember for quite some time. Well, at least since last summer's moderate drought. It was so dry that until this evening, the last time I had to got to mow the lawn was four weeks ago, on August 15th. But now the rain has returned, the rain lilies are blooming, and the grass has recovered, so I'm back to in the mowing business, having just mowed for the 32nd time this season. That's still six more times than at this time last year! 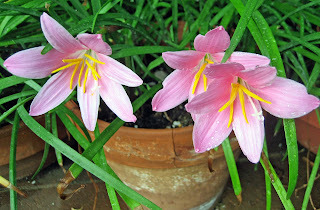 These rain lilies (Zephyranthes) aren't winter hardy here in USDA hardiness zone 5, so I grow them in pots on my front porch. There the only "rain" they get is from me watering them. In spite of that, they really do bloom best when it has recently rained. How do they know? It must be the humidity. Once it gets frosty cold, I'll move the pots of rain lilies into the garage, where it never quite freezes but can get cold, and forget about them until spring. Then when spring arrives, I'll bring them back out and start watering. Every few years, I dig the bulbs out of the pots and repot them in new soil. I always end up with extra bulbs when I do this, which are nice to passalong to others. Someone left me a comment the other day asking about what to do with rain lily bulbs they had recently purchased, since they are also in zone 5. I assume the bulbs have been in a package all spring and summer, so I would probably pot them up right now and get them growing, even if I had to bring them inside for awhile to grow a bit longer. Then I'd gradually taper off watering and let them go dormant until spring. I'm glad these rain lilies are blooming because the other affect of the last four weeks of dry weather has been a reduced amount of bloom around here. But that isn't going to keep me from posting about what little bloom I have on the 15th for Garden Bloggers' Bloom Day. I hope YOU will also join me in sharing what you have in bloom, regardless of what kind of weather you've had, and I know many garden bloggers have had quite challenging weather this summer. It's been hot and dry in many places like Texas and Oklahoma. Here in Indiana we had a very wet June and July followed by a month of virtually no rain. And those along the gulf coast have been hammered with hurricanes. In spite of it all, I'm sure there are still blooms in most gardens, maybe not a lot of blooms, but blooms none the less. Whether your blooms are all dried up or sopping wet, please share them with us on the 15th by posting about them on your blog and then leaving a comment on my bloom day post so we can find you and come visit to see your blooms. All are welcome to participate, whether for the first time or the twentieth time, which is how many times you will have posted if you have participated since the first bloom day on February 15th, 2007. Someone check my math! Oh...pretty pink rain lilies! Annie has those too...I've only found white ones which I did buy...they bloomed a few weeks ago...they weren't very exciting. Yours are lovely! 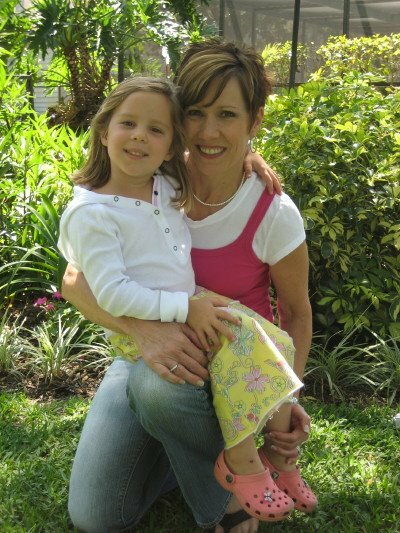 Hi Carol, I just love your blushing pink rain lilies. Mine just stay in the ground all year and bloom in the spring then throughout the summer. They are hardy little pretties. I keep meaning to try some in pots too. I've noticed the same thing about the rain working better than irrigation... and Lord knows we have plenty of humidity for them. Carol - those are so pretty! I've never even heard of "rain lilies". Every time I think I'm about to get a hold on this gardening thing I realize I don't know crap, really. My garden is full of white flowers from Zephyranthes candida, August rain lily is in full bloom. We have had a bunch of rain and they just love it! It sure is nice to be able to mow more this year isn't it? I'm not sure I mowed but once in August. I'm glad the rain has returned. It sounds like a good plan you have for the lilies. They are very nice, what is their hardiness zone? I was looking forward to this GBBD thinking that after a good drenching from Ike, a lot of flowers would burst forth in fall ecstacy. Oh, well. As for the rainlilies, they prefer to go completely dry (parched) between waterings. Then when they get water they think, "This is it. Better go for it." That attitude comes from their native land. Lots of dry and then a flood. If you keep them moderately watered all the time, they don't equate it with the drenching downpour that brings them out. I'm tempted every time someone posts photos of tender bulbs. Good thing age has brought me some wisdom. I know I'm too lazy and/or forgetful to take care of them. It's so much easier enjoying them vicariously - thanks. I've moved too many times in the last couple of years to keep up with all the mowing times. I've also lived in 4 different states. In all, I've lived in 15 different states. I would have to say that since being back in my home state, this is the most hot and dry I've ever experienced. I bet we didn't mow 5 times in all. Your lily is really pretty and looks worth the effort. Those Rain Lillies are glorious Carol. I keep meaning to order some of those...:) See you on GBBD tomorrow.